Just How Many Breweries Can Ocean Beach Handle? 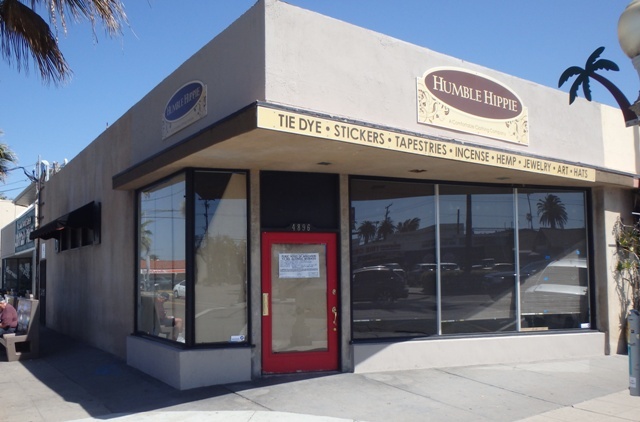 Helms Brewery is moving into the former Humble Hippie at the corner of Newport and Cable. 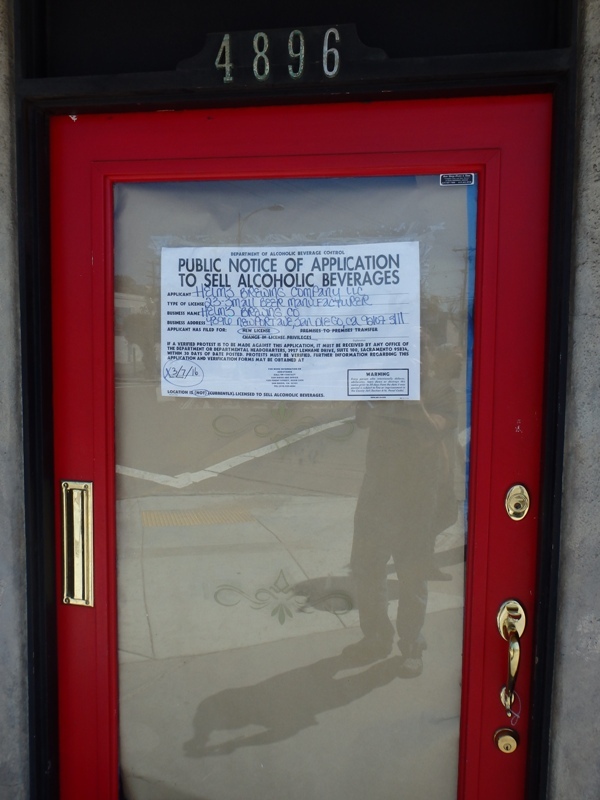 With 3 New Breweries About to Open on Newport, Is OB Becoming Another Pacific Beach? 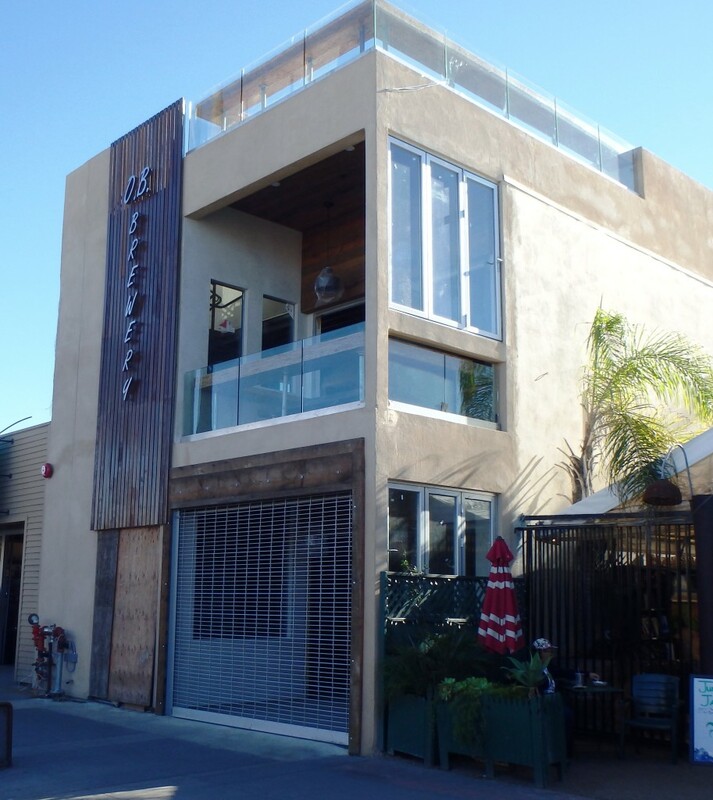 Just how many breweries or beer tasting storefronts can Ocean Beach take? Just how many beer joints can Newport handle? These are the questions that are paramount on the minds of those OBceans who understand what’s happening on Newport Avenue, the main commercial drag in the village. Door at Helms with notice. We ask the questions, because as of right now, there are 3 (that’s right – three) new beer breweries about to open on Newport. 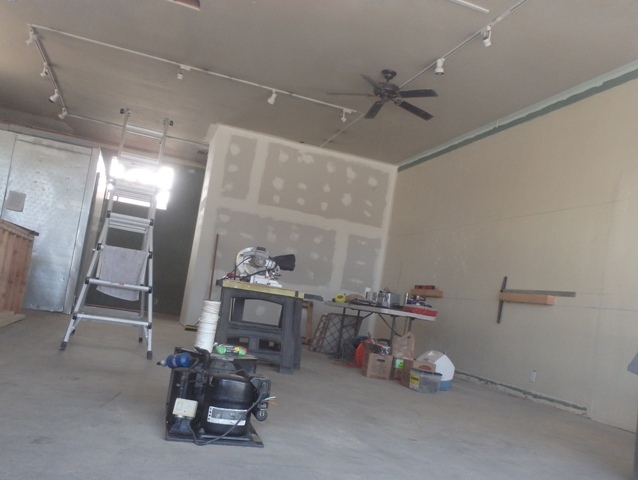 Actually, they’re not all real “breweries” – as two will be beer tasting rooms. A real brewery has to actually brew the sudsy stuff on site. Everyone knows that the OB Brewery on lower Newport is about to open. We’ve been talking about the place as it has an exterior railing that has upset some in the community as an unnecessary encroachment into public space. The place is owned by the folks who own Newport Pizza, across the street. Now, there are 2 new beer places about to open. Each has their alcohol notice taped to the doors. Notice to sell beer by Helms Brewing Co. 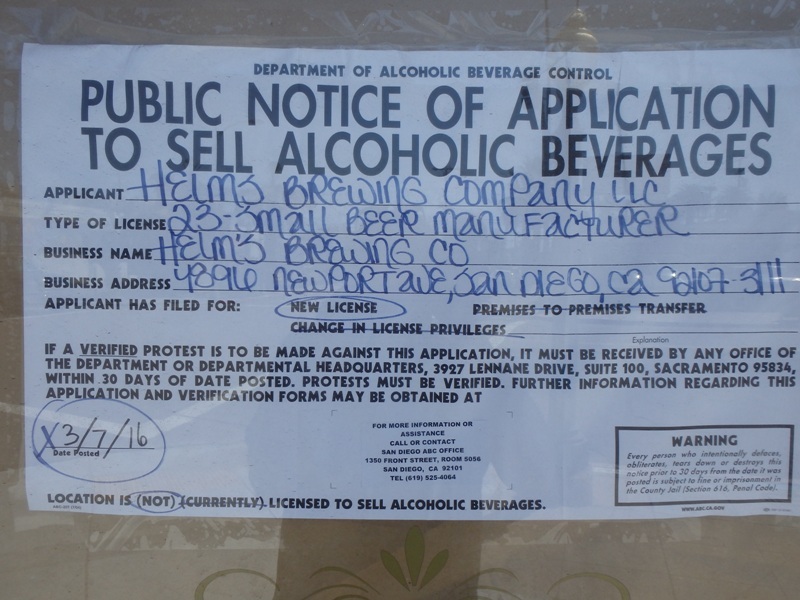 The first one, at the former Humble Hippie storefront, is Helms Brewing Company at 4896 Newport Ave. Their notice went up March 7th. Some progress inside the new Helms Brewing. The other new beer joint is up the street abit, in the former yoga place (that just had opened – what? less than 6 months ago?). 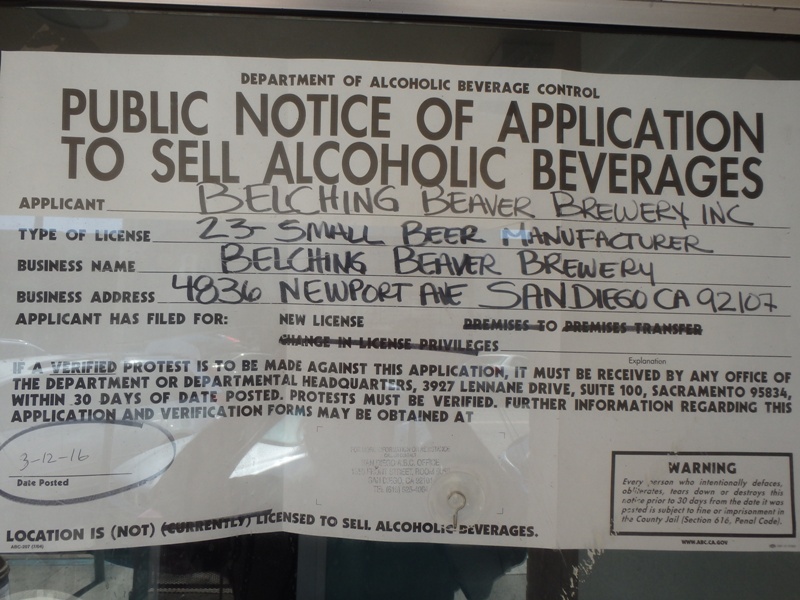 Belching Beaver Brewery has leased the space. Their notice went up on March 12th. 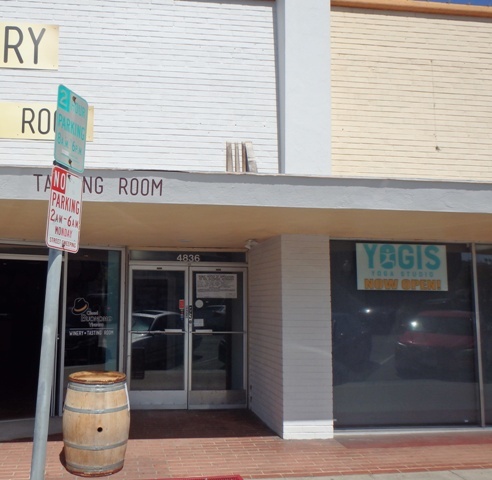 Interestingly or not, it’s right next door to OB’s first winery and is across the street from another beer tasting place, Culture Brewing Co.
Site of future Belching Beaver beer tasting room (on right) in former yoga place. Public notice for Belching Beaver Brewery Co.
You do the math. And don’t forget to count the restaurants on Newport that after they quit serving food, turn into basically beer joints and bars. Walking around downtown OB on Wednesday, I encountered several people who did not savor the prospect that OB is turning into Pacific Beach with all its bars and nightclubs and restaurants. This is not a pleasant thought for them. If a verified protest is to be made against this application, it must be received by any office of the Department or Department Headquarters, 3927 Lennane Drive, Suite 100, Sacramento 95834, within 30 days of date posted. So people have a month to send it verified protests of these applications. Helms posted theirs on March 7th, so we have until April 5th or 6th to get anything in. And Belching Beaver posted theirs on March 12th, so there is time until April 10th or 11th. I doubt they all last. Way too over saturated. Not happy with all these breweries. People exclaim they don’t attract the “type” of drinker who causes problems, yet as a resident of Bacon I’ve noticed a sizable uptick in loudness, foot traffic, and drunk driving/fights in the last year. Always around 1-2 AM. I’m all for beer – I just don’t think we need to become PB, as you stated. The unfortunate issue is what do you put in these locations instead? More tourist traps? The sizable uptick isn’t due to these places since none are open yet. If you think it’s culture, consider they close at midnight on weekends and 10 (if they have customers) on weeknights. Unfortunately, you’re right, what do “we” put in these empty storefronts? It’s obviously not a hookah bar, as that place is now gone. It’s also not humble hippie, a yoga place, or a smoke shop. It’s probably also not a burrito place, a record store, a fancy restaurant, a movie theater, or a surf shop. SD is unique when it comes to beer; maybe OB is the more attractive beer tour than Mira Mesa. Re PB, I’d rather see 1 brewery and 2 tasting rooms open over a single bar that serves beer AND liquor. It’s outside the full bars at 130am that things really get dicey. I’m down to give these beer places a shot. I don’t think a few beer tasting rooms turns into full blown PB mayhem. Why do people seem to feel the need to comment on things that they have no clue about? I mean, if there is a problem that is affecting you, do the basic research as to the cause ffs. OB has an over-concentration of liquor licenses (1 license per 153 population). State law allows 1 per 2,000. There are more liquor licenses here per capita than in PB. Restaurant and bar licenses do not require a city Conditional Use Permit and thus do not undergo any city land-use review process and are not reviewed by local planning groups. public convenience or necessity (PCN) must be made in order to grant the license. I haven’t spent a lot of time in these brand-specific brewpubs, to be honest, but I see them as a bit different from typical bars in the type of clientele they’d appeal to. With a concentration of some of the region’s standouts offering tasting rooms within a few blocks of one another (don’t forget Mike Hess in the old dog wash on Voltaire! ), OB could be a great draw for “beer tourists,” which are a thing and a thing that is growing. One question – are the tasting rooms all-night affairs, going until 1 or 1:15 in the morning, or do they shut the doors up a bit sooner? Brewery Tasting Rooms in Ocean Beach create an attraction for local Peninsula residents as well as visitors resulting in economic opportunities for nearby “mom and pop” owned businesses to do well. OB Brewery Tasting Rooms are good news for our community. These are family friendly/dog friendly establishments that only serve beer, not liquor. They give back to the community by doing a ton of charity events and are good for OB. The hours are usually only until 10pm and I believe they require LEAD certified bar staff to watch out for over serving and other problems. OB Brewing Company may be a different story but these tasting rooms are not a problem. In fact they may help clean up that corner on Cable and Newport by the bus stop. I also wanted to comment on the Pacific Beach comparison. There are ZERO tasting rooms in PB so it’s an apples too oranges comparison. Is it wrong to have the perception that there are blocks in the PB commercial areas that are literally party areas, with many bars, nightclubs, restaurants open at night? No it’s not wrong to have that perception. The tasting rooms are 100x better than a bar opening where they serve liquor. Every time I’ve gone to culture its to have 1-2 beers and that’s it. It always seems to be pretty relaxed in there, it really is a different crowd than going to a bar in PB. There are a couple of tasting rooms in PB now and it doesn’t actually seem like they do as well as the ones in OB. All of the beer tasting rooms feature the products of independent breweries. Support your independent brewers! Im all for it,beer attracts wonderful people and is good for the community. Then why did they outlaw drinking on the beach, drunk rowdy people not being able to control themselves in public. Well what is it,a wonderful thing that will bring prosperity or demon juice that will bring about the downfall of society. I guess it all about whos making money off of it. I personally would like to enjoy a beer at sunset on the beach without being arrested . I’m surprised by this. I imagine that time will tell if OB really wants or needs these brew houses/tasting rooms. Or maybe they’ll be a way for the owners to do some fancy accounting for other businesses? And on a similar note: Where do I lodge a formal complaint about Gallagher’s new sound system and live music. I cannot sleep in my own apartment on Niagara b/c they start every night around 10 to 2 am with the bass driven live music. I understand the new owner put in a beefed up sound system a few weeks ago. What kind of permit was involved for that?? You cannot compare the breweries moving into Ocean Beach to the bar scene in Pacific Beach. For starters Brew houses and taprooms are pet and child-friendly and usually have a pretty mellow family/friendly vibe to them. Nothing like bars and nightclubs in Pacific Beach. Breweries sponsor local events and contribute to the community way more than bars and nightclubs. Breweries appeal to a wide demographic of people where bars and nightclubs appeal to a much younger crowd. I think it’s great that Ocean Beach is becoming craft beer destination in the new capital of craft like hops Highway, Beeramar and 30th Street. I hope to see a few more local craft breweries open tap rooms around the neighborhood. Times are changing for the better. This is nonsense…OB has always been a bit rowdy and party – always been full of bars. These brew pubs are incredible and give OB a new dynamic. An no people will not confuse it with PB. Half these commentators need tomstepmiut of their house every now and again. The problem is not the amount of places. The problem is the existing places that overserve waisted people. There’s one bar that serves a known judge until it looks like he pees his pants. I’m looking at you Joint, Harp, Noodle House, Pac Shores, Raglan, etc. None of these places cut anyone off. I think part of it is they are regulars so they think they are walking home. What if they don’t? What if they get hit by a car or assaulted? No offense OB but I think the dog pooh, and violent / criminal element, and over priced rent / VRBO saturation should be more of a concern than local breweries. I do not agree that this will be like PB because of the breweries. Microbreweries while yes I’m SURE some people do get tipsy are more for beer connoisseurs not Douchbags that just drink to get drunk, like they do in PB. Guarantee you the people that get WASTED and cause a nuisance to the public are NOT people that appreciate or can even afford Craft Beer.